I’m just going to say it: I really don’t get why this one is even here. It has to be the easiest of all the first six problems. I usually feel like each ProjectEuler problem is cleverly designed to teach some new concept or syntax, or reveal a flaw in earlier code – but I don’t see it with this one. Anyhoo, I used just a single loop, in which I summed all the squares, and also kept track of the sum. After that, I just squared the sum, subtracted, and there you are. print "The difference between the sum of the squares and the square of the sums of the first 100 natural numbers is: " + str(abs(sumOfSquares-(sumz*sumz))) + "." 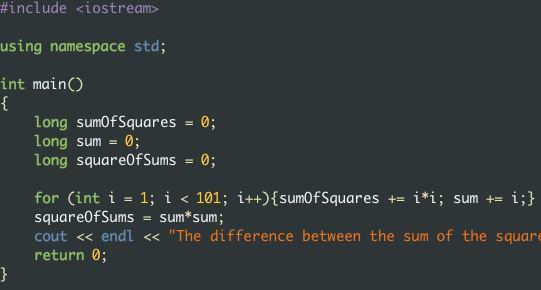 You can write a program that computes this difference without using for loops. Hint: the sum of the first n integers is n(n+1)/2 and the sum of the squared first n integers is (n+1)(2n+1)/6. This also makes it so you can solve it by hand, freeing you from tediously computing these sequences in an iterative fashion.